“Hyperconnected Museums: New Approaches, New Public”. 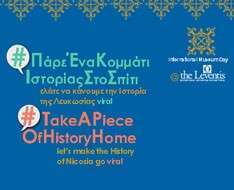 Within this framework, the Leventis Municipal Museum of Nicosia organizes a creative action titled “Take a piece of history home”. Join in and let us make the history of our city go “viral!” Four Medieval Lefkosia items, exhibits at the Leventis Municipal Museum, are produced in replicas and invite the public to “adopt” them for a few days. 17.30 – 18.30 Special guided tour: «Four medieval historical objects and their stories». The objects unveil historical aspects of the city of Nicosia. The tour will be delivered in Greek.